Here is Julia’s 100 word challenge for this week. Please go here to read more flash fiction. The prompt this week is ….‘aside. Now what was that rabbit late for,’ wondered Alice…..’ It is the last ten words of the piece written by Shade the Raven last week. The first story is a continuation of An Invitation To Tea, my contribution to last week’s challenge. Wordcount for both stories is 100 including the prompt. Hope you enjoy my interpretations. I welcome your feedback. Alice refused the old man’s offer of blood for tea. The rabbit looked disappointed, as it jumped from the table and hopped out of the cottage. Alice pushed her chair aside. ‘Now what was that rabbit late for?’ wondered Alice. She followed the rabbit down a tiny footpath. The forest grew darker and the grassy undergrowth turned into thorny bushes. Alice sacrificed her arms to protect her eyes from being pierced. Tripping over an unseen root, she stumbled upon another clearing. Her blood froze, witnessing the scene before her. ‘Now would be a good time to wake up,’ thought Alice. A gigantic CGI generated rabbit hopped at a tremendous speed. In the last second before a certain head-on collision, the ‘Alice’ actress jumped aside. The ensuing onscreen dialogues were lost on Justin. From the corner of his eyes he observed multiple colours flicker on Sarah’s face, making the moment more surreal. She reached for popcorn from the bag between them. He stuck his hand in, just as she was about to retract hers. The briefest of touches resulted. As if he were on a rollercoaster, Justin’s stomach made a double flip. 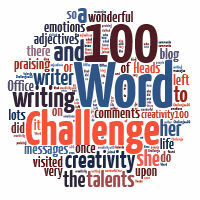 Here is Julia’s 100 word challenge for this week. The prompt this week is ….‘What was the rabbit late for,’ wondered Alice…..
Wordcount 108 including the prompt. Hope you enjoy my interpretation. I welcome your feedback. Alice focused on reading the rabbit’s thoughts. “What was the rabbit late for,” wondered Alice. She followed the rabbit into the forest. The dense tree crowns hid the sun, causing Alice to shiver in the cool summer day. Soon she saw a cottage with the front door open and followed the rabbit in. “Ah! Just in time for tea,” said an old man. He was alone but the table was set for two. Alice sat up in bed. It was only a dream! Important Appeal from one of your readers! I don’t know if there’s any way to post a message that everyone can see but for all the blogspot people, it’s very hard for those of us who aren’t members of blogspot to ever get to post a comment. If the word matching is turned on, it never thinks you’ve matched and sometimes when it’s not the comment just hangs up while it blinks back and forth to the word matching but never posts… I note from comments that I’m not alone. Definitely helps when people turn off the word match but maybe blogspot needs a heads up? Now for this week’s prompt. As you know I like to be topical so I’m thinking Easter. However, I’m thinking a little outside the box! The prompt is quite simple but the trick this week is to prepare for NEXT week! This is a 100 word plus the prompt, …the red box…, flash fiction challenge hosted by Julia. Pete stared dreamily at the photocopier. The CEO was scheduled to arrive that morning. Maybe he would be in the meeting too and witness Pete’s strategy to increase sales. That overdue promotion could finally be his! He caught a flash of colour from the corner of his eyes. He turned to look directly at Mr. Smith walking down the aisle. He was carrying the red box. Pete felt sweat beads rolling down his forehead. His colleagues had noticed the box too; their eyes glued on its path. All were silently praying it was not their time to pack their personal belongings into the box. Brian looks down at his shuffling feet. Brian looks at her with those gold-speckled green eyes, which had melted her ironclad reserve two days ago. Linda sits down heavily on his bed. Hugging her abdomen, she rocks herself to pacify her nerves. Taking part in a 100 word challenge hosted by Julia.